As Vienna becomes the capitol of eastern European expansion, due mainly to its stable government and its central European location, businesses large and small must be prepared to integrate all nationalities and their languages into the workplace. 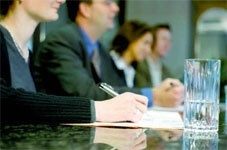 We offer German programs for your employees and their family, taught on the premises of your company. German for Living—this course is designed help your new employees and their family members adjust to life in a German speaking country. The course covers the basics of German & the topics covered are similar to our crash course topics. Business German—this course is designed to bring your non-native German speaking employees up to speed on the German business lexicon. International Languages—take a look at our programs in basic language skills & cultural traditions for any of the International languages offered by Learn Personal. Our teachers are chosen amongst a wide range of applicants not only for their educational accoplishment, but also their business & cultural experiences. This is what sets us apart from our competition.